Obviously, none of these fare-collecting ferrymen wanted competition from a bridge, so they attacked it with lawyers and legislators. The ferry companies, allied with steamboat lines, commission merchants, and even some preachers who claimed the span would lead to “Sabbath-breaking,” campaigned to convince Cincinnati that a bridge meant certain ruin. Adversaries stymied legislation for years. When approval finally passed in 1849, opponents inserted a clause prohibiting the bridge to directly align any Cincinnati and Covington streets. By then, engineer John A. Roebling had devoted four years to the project. He endured 17 more years of Porkopolis pigheadedness until that crisp autumn morning when the gates opened and more than 45,000 pedestrians strolled across his magnificent new monument. That inaugural crowd represented more than 15 percent of the entire combined population of Cincinnati, Covington, and Newport, and every one of them paid a toll. They continued to pay tolls for 97 years. 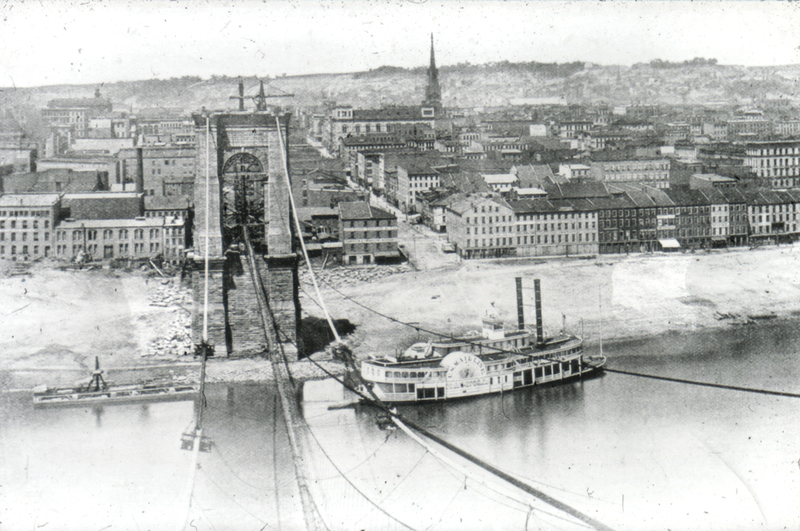 The suspension bridge was private property, constructed by the Covington and Cincinnati Bridge Corporation and owned by that entity until 1955, when Kentucky purchased it. Toll collections finally ended in 1963 when the Brent Spence Bridge siphoned traffic downstream. Roebling, who went on to other glories, including the Brooklyn Bridge, saw the misalignment as a lost opportunity. “No avenue in any of the large capitals of Europe,” he lamented, “could now compare in beauty of grandeur with that long vista which would be presented by the line of Vine Street on the one side, continued in a straight course by Scott Street on the opposite shore.” Even so, we still have our remarkable span.